Currently New Zealand accepts 750 'quota refugees' every year - a number that hasn't increased since 1987. That puts us at 90th in the world (per capita) for accepting refugees. I'm increasingly seeing calls to increase this number, but those calls are often met by concern. People worry whether this will increase unemployment in New Zealand, whether this influx will dilute our culture and even whether such refugees will bring the conflict they're fleeing with them. 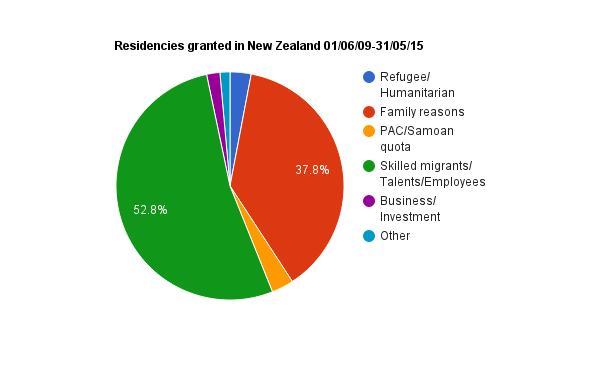 That got me thinking: what proportion of those we grant residency to are actually refugees? And who are the other people we let in? It turns out that people granted residency for refugee/humanitarian reasons are a tiny proportion of the total. Surely too tiny to have much impact on our culture or our job-market! If we're concerned about the impacts immigrants have on those things, quota refugees aren't the problem. If we'd like to basically retain the status quo, why not reduce the number of skilled migrants we bring in, rather than keeping the refugee quota static? We could double the number of people accepted on humanitarian grounds to 6% without changing the total number of migrants: just offset them by reducing the number of skilled people we take in from 53% to 50% of the total. I suspect that would hardly make a difference to the job-market, whilst having a huge impact on some very desperate people. That still leaves the concern of whether more refugees will bring more conflict with them. That's an understandable fear, but I think a largely groundless one. I haven't looked into it, but I've rarely heard of conflict being introduced into New Zealand by refugees, so any increase would likely leave it at a very low level. You can see a spreadsheet with all the data used to generate the pie chart here. The most processed data is at the top and as you go down you eventually reach the raw data. Quite a few steps were involved in going from their numbers to my simple chart! The categories on the pie chart are my own. There are a truly surprising number of categories under which residency can be granted. I have grouped them into ones that seemed to have a similar rationale behind them. Refugee/humanitarian is broader than just quota refugees. It also includes other categories that had 'refugee' in their title but didn't appear to be part of the quota, as well as the categories 'Victims of Domestic Violence' and 'Humanitarian'. Family reasons is mostly foreign spouses of NZ citizens/residents or their children or parents. This doesn't include refugee family reunifications - they're in the refugee/humanitarian category. PAC/Samoan Quota is people from Tonga, Tuvalu, Kiribati and Samoa who can come in under quota schemes. Skilled migrants/Talents/Employees includes not just skilled migrants but also people who come in with 'talents' in sports or arts and culture (!) or as employees (presumably being relocated from overseas).